Our brilliant promotional Company Car Safety Lights won't just add some light to your Company brand-name, but they'll magnetically attach to any part of the car's exterior - providing necessary light to aid in repairs and emergencies. The powerful L.E.D's inside the Company Car Safety Lights shine more than enough light for good visibility featuring a 9 mode flashing sequence, powered from 2 AAA batteries. 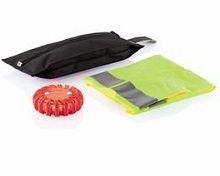 Included in this great Corporate business gift is a high visibility vest for safety. Why not personalised these Company Car Safety Lights and hand out a batch to customers to promote road safety and your Company branding and logo at the same time? For a FREE QUOTE, please fill in the form regarding our Company Car Safety Lights and we'll be able to help you.